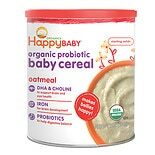 Shop Happy Baby Organic Probiotic Baby Cereal: Oatmeal (7 oz. )7 oz. $399$3 and 99 cents$0.57 / oz. $499$4 and 99 cents$2.97 / oz. 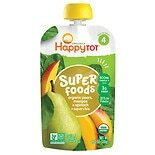 Shop Happy Tots Organic Superfoods Spinach, Mango & Pear (4.22 oz. )4.22 oz. 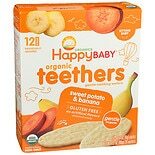 3 for 5 dollars and 00 cents or 1 for 1 dollars and 99 cents 3/$5.00 or 1/$1.99$0.47 / oz. 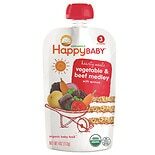 Shop Happy Baby Organic Baby Food: Stage 3 / Meals, 7+ Months Beef Stew (4 oz. )4 oz. 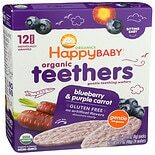 $139$1 and 39 cents$0.35 / oz. 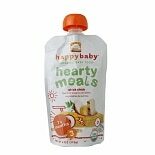 Shop Happy Baby Organic Baby Food: Stage 3 / Meals, 7+ months Chick Chick (4 oz. )4 oz. $149$1 and 49 cents$0.37 / oz. 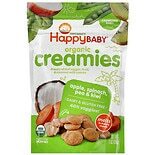 Shop Happy Baby Organic Creamies Apple, Spinach, Pea & Kiwi (1 oz. )1 oz. $449$4 and 49 cents$4.49 / oz. 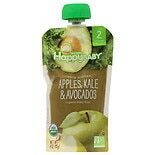 Shop Happy Baby Clearly Crafted Baby Food Apple/ Kale/ Avocado (4 oz. )4 oz.